Relcross have employed their problem solving experience by supplying Von Duprin 99QEL exit devices to Advanced Diesel Engineering (ADE) of South Kirkby in Yorkshire. 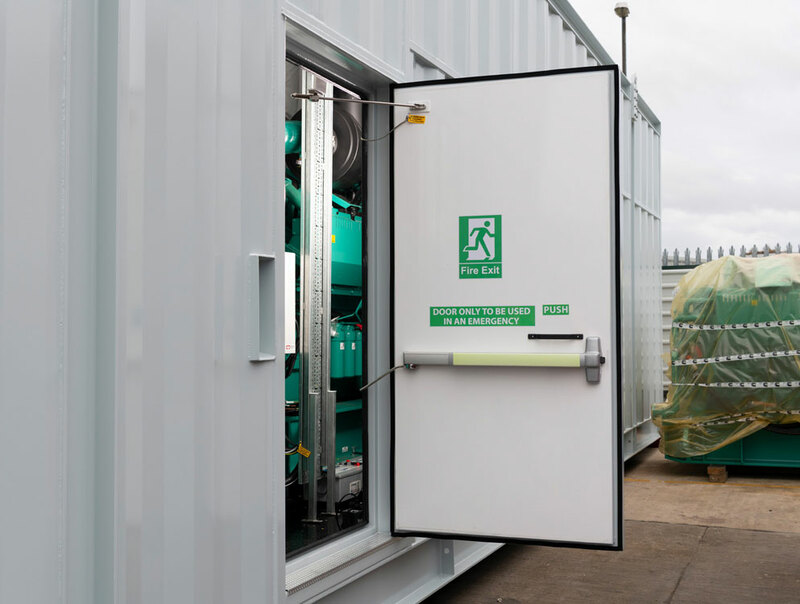 ADE are experts in acoustic containers for generators and their products can be found in an increasing number of data centres throughout Europe. Data Centres have banks of generators on stand-by, ready to come online in seconds in the event of a power failure. But generators, especially un-containerised diesel generators, are very loud. So loud that they present a substantial problem for anyone nearby and a large number in close proximity would be totally unbearable. A silent generator operates inside a sound proof container or generator enclosure which muffles the sound heard by workers, employees, customers and members of the public. But like so many problem solving technologies, the solution to the main problem creates other problems to be solved along the way. One of the many that ADE have had to overcome is how to safely and securely open and close the heavily insulated steel doors that provide essential access to the generator and other equipment inside the enclosure. It’s not a problem that most people would anticipate but ordinary door hardware just would not work. The doors are too thick and, apart from access control for security, emergency exit from the enclosure must also be provided in the event of fire or other such eventuality. Normal entry and exit is controlled by a swipe card system that disengages the door alarms while recording the details of who has entered or exited the container. A key operated lock can then be used to open the door by releasing the latch on the Von Duprin device installed on the inner surface of the door. When exit is required the swipe card is used in the same way before the touch bar is used to release the door latch. The Von Duprin 99 QEL features motorised latches rather than magnetic solenoids which, together with the famous Von Duprin fluid dampener that decelerates the touch bar on its return stroke, eliminates most of the noise associated with exit device operations. In the event of an emergency the touch bar can be used independently and without any delay. In such instances the alarm will also sound to alert security. 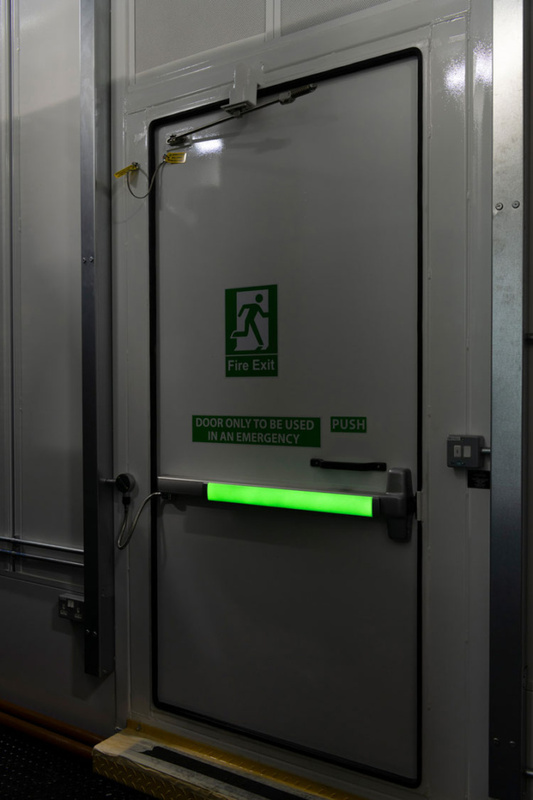 As a further safety feature, the touch bar is covered with a luminous material to provide guidance to people trying to escape from the enclosure if the lighting fails or vision is inhibited by smoke. 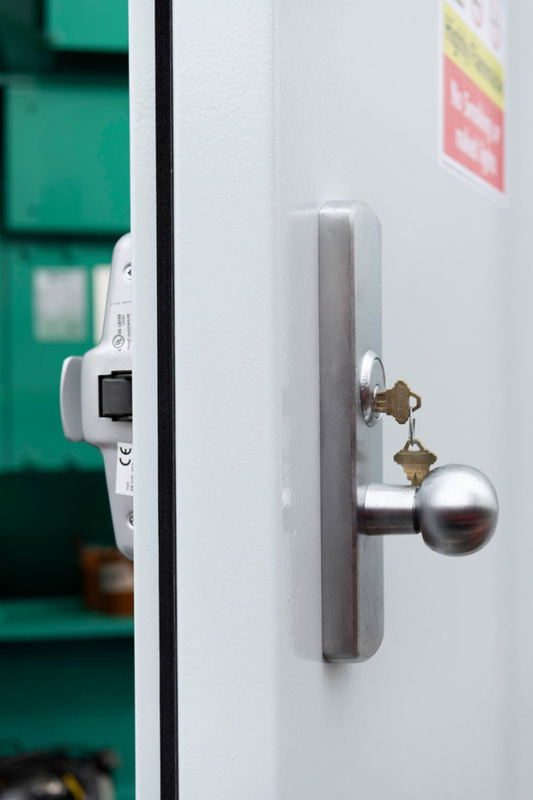 The Von Duprin 99 QEL, with so many unique features, provides the safe and secure answer in a wide range of demanding installations.